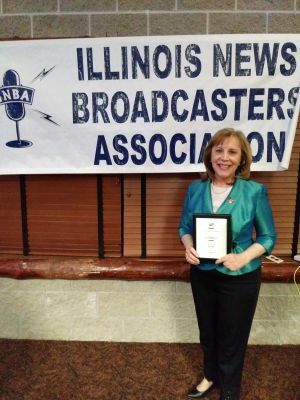 In April 2018, Ms. Valente received a Best Reporter Award from the Illinois News Broadcasters Association. 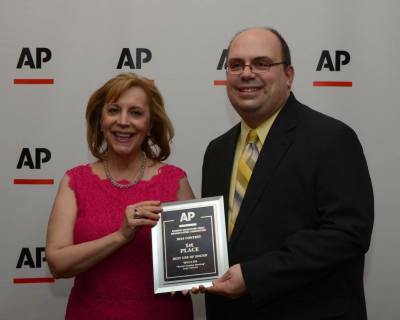 Ms. Valente and Associated Press President, Will Stevenson. 2017 Three Illinois Press Association Awards, including "Best Investigative Series," for "What's In Your Water? 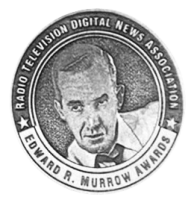 2015 Edward R. Murrow Award, Best Investigative Series, Radio, for "Police and Race in the Twin Cities"
2014 Catholic Press Association First Place Award, "Best Spirituality Book in Paperback" for Atchison Blue: A Search for Silence, A Spiritual Home and a Living Faith. 2014 Catholic Press Association Award, Second Place, "Best Spirituality Book in Paperback," for "The Art of Pausing: Meditations for the Overworked and Overwhelmed. "Mother of God Monastery, Watertown, South Dakota." (Poem). 2008 Eric Hoffer Award (Poetry Book) First Runner Up: Twenty Poems to Nourish Your Soul. 2005 Jo-Anne Hirshfield Poetry Award: "Body & Soul" (Poem). Best Catholic Writing of 2004 (Essay) "The 5:30 Irregulars"
Inventing an Alphabet (Book), awarded by Pulitzer Prize winning poet, Mary Oliver. 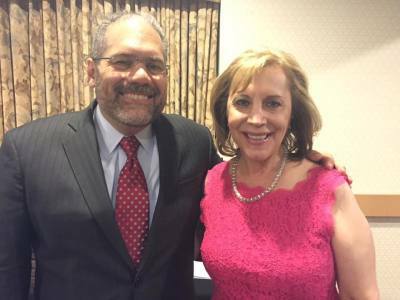 Ms. Valente and National Public Radio host Ray Suarez at an Illinois Broadcasters Association Awards Banquet in 2016. ​​2004 Unity Award in Media: “Misericordia” (Feature Film). 2003 Illinois Arts Council Poetry Award: "Green" (poem). 2002 Certificate for Creative Excellence: “Deaf Mass.” (Televised Report). 2001 Silver Screen Award: “Rural Churches“ (Televised Report). Ms. Valente interviewing noted spirituality writer, Sister Joan Chittister in Erie, PA. Ms. Valente is a columnist for Sister Joan's Monasteries Of The Heart website. Left, receiving Best Reporter Award from the Illinois News Broadcasters Association in April 2018. 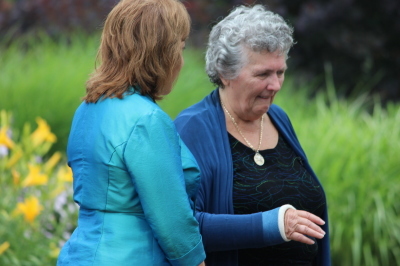 Above, talking with Brother Paul Quenon, her co-author on The Art of Pausing, at the Abbey of Gethsemani in Kentucky. Board member, International Thomas Merton Society. Board Member, McLean County League of Women Voters. President-elect, Illinois Grand Prairie Master Naturalists. Planning Commitee Member, International Oblate Congress for 2021. US Delegate, International Oblate Congress, Rome 2017. Oblate (Lay associate), Mount St. Scholastica Monastery, Atchison, KS.